This week I registered for the Food Blog Forum, a 1-day food blogging seminar held at UCF Rosen College of Hospitality near the Orlando Convention Center on April 9, 2011. 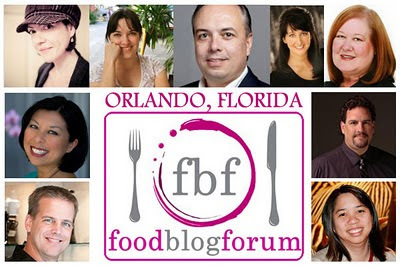 This will be my first ever seminar on the topic of Food Blogging, so I'm looking forward to networking with other local bloggers and really learning how to improve my blog. I'm not so sure I want to be a big time blogger but let's see what new opportunities arise from this conference! We are now harvesting lots of potatoes, broccoli and finally cabbage! I can't wait to make curried cabbage this weekend. Look for the recipe in an upcoming post this week. I'm behind on the posting at least 4 kale recipes, though I will catch up as soon as the final class of my Plant Based Nutrition Bootcamp is wrapped up at the Florida School of Holistic Living. I will be teaching some vegan cooking classes in the next few months following the bootcamp. I will be announcing the classes on March 5th! I started my family on Juice Plus back in 2005, after attending a presentation in my friend Jessica's home about Standard American Diet nutrition and how Juice Plus helps to foster healthy eating habits. At the time I was having health issues and I was looking for ways to add more fruits, vegetables and antioxidants to my diet. 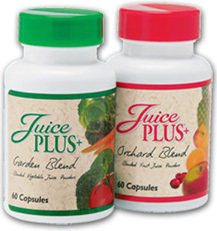 Besides improving the nutrition in our home I decided to get at least myself and the kids on Juice Plus. Well, here we are in 2011 and we are still on Juice Plus. We eat a high amount of raw food thanks to our garden and the Vitamix, but I like being on the product as an added layer of protection, especially in the winter when colds and flu are circulating. We like the capsules and the Gummies now that they are both vegan. The product contains the nutrition from 17 different raw fruits, vegetables and grains. It is not a multivitamin, rather a "whole food supplement". So my opinion is yes, it is worth the investment. If you are interested in finding out more about the product you can contact me or anyone you know personally who sells Juice Plus. As I posted earlier this month, we are harvesting tons of salad every week. Now my husband is taking salad to work every day and having salad for lunch on the weekend! This is a photo of what he calls "The Manly Salad" because let's face it, salad has the reputation of being "girly" and that's why most men are opposed to eating it. He added the low sodium SprouTofu, organic raw salsa, carrots from the garden and baked corn chips. The dressing is an Asian Pineapple dressing I made from the Moosewood Lowfat cookbook. It was super tasty. I will be posting the recipe this week. These were picked fresh this weekend from our garden! We've just been eating them straight up with the roots and dirt and everything...and they are good! "Tara" from Altamonte Springs! Tara has won a FREE ticket to my Plant Based Nutrition and Wellness Bootcamp starting this coming Wednesday at the Florida School of Holistic Living! All she did was subscribe to my blog and post a few comments! I'm all about eating low fat, but I really do love nuts and nut butters! I especially love this Raw Tahini by Artisana. It is AMAZING! It adds a wonderful creaminess to any sauce, salad dressing, dip or hummus. You can also make some really tasty simple raw desserts- like stuffing a date with it or mixing it with oats and agave nectar and rolling it into balls. My kids like to spread it on a Seaweed Rice Cake for an afternoon snack. I plan to experiment with it to make a raw icing for my youngest daughter's birthday in May. Artisana Raw Tahini is high in Calcium and Iron and contains 3 grams of dietary fiber and 6 grams of protein! And now for the fat grams...18 grams of fat per 2 tbsp serving! So be conservative when using it, a little goes a long way:) Of course this is definitely better than using oil. When you consume fat that is in it's natural package with fiber and other nutrients, it is a much healthier source than oils which have been extracted and concentrated. On the Eat for Health program we get our fats from whole food sources like nuts, nut butters, grains, avocado, and nut milks. We don't cook with oils, we use vegan broth, coconut water, carrot juice or pineapple juice to start meals on a non-stick pan. I'll talk more about oil free cooking and baking in an upcoming post! 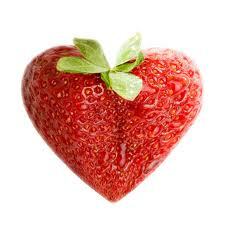 In the meantime, please leave a comment and let me know what your favorite (somewhat healthy) indulgence is! Arnell Burghorn is a Nutritional Education Trainer certified by Dr. Fuhrman's Nutritional Education Institute. 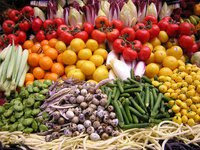 Free Introductory Lecture: On Thursday, February 10 from 7:00 to 9:00 pm, a free introductory lecture about the Eat For Health Program at the Family Life Health Center, 129 Garden Avenue North, Clearwater, Florida, 33755. Join the hundreds of people who have completed this program and achieved their goals to lose weight, reverse disease and gain youthful vitality! Call 727-595-7597 to reserve your seat. Free Lecture at Nature’s Food Patch: On Thursday, February 17 at 6:30pm, a lecture on "Conquering Food Addictions and Overeating". There will also be cooking classes beginning in April! You are welcome to join one of the online webinars for no charge. Call Arnell at 727-595-7597 or email her at Arnell@TheNutrientDensityDiet.com. Valentine's Day is approaching and Cafe 118, Orlando's only raw food restaurant, will be offering some delicious specials all day for $58 per person. Four delicious courses of "blissful indulgence" awaits at Cafe 118 Degrees. Damiana (tunera aphrodisiaca) as noted in its botanical name, damiana has a reputation for arousing sexual desire. Herb of choice to strengthen hormone balance in both men and women. Holy Basil (ocimum sanctum) Known to elevate mood and spirit. Prevents and treats stress. TODAY is the last day to subscribe and enter to win my Plant Based Nutrition and Wellness Bootcamp at the Holistic Living School in downtown Orlando. This is an 8 hour class valued at $75! The way to subscribe to my blog is to find the button on the right hand side that says "Follow". It is located above of photos of subscribers to my blog. We had coleslaw at Ethos Vegan Restaurant a couple of weeks ago and my kids have been asking for coleslaw ever since. I've never been a big fan of the stuff, but if it means my kids will eat more cabbage, I'm game! I made some over the weekend and added it to my veggie wrap and it was really tasty. Luckily I found a recipe in a cookbook I already have on loan from the library, Vegan Soul Kitchen! It's pretty simple and straightforward, as the title suggests! I changed it up a little. I used Apple Cider Vinegar in place of Red Wine Vinegar, omitted the olive oil and added a sprinkle of Cayenne Pepper on top. Quarter the cabbage and shred in a food processor. In a small blender like a Magic Bullet add mustard, tofu, vinegar, agave and salt. Add dressing to the green cabbage and massage until is shrinks down, about 3 minutes. Cover and refrigerate for at least 1 hour before serving. Thanks to my friend Jill at Vegan In The Kitchen for her post about the Dr. Sears Nibble Tray! Dr. Sears is a nationally recognized pediatrician and has authored The Family Nutrition Book and many other titles related to Pregnancy, Birth, and Nutrition. 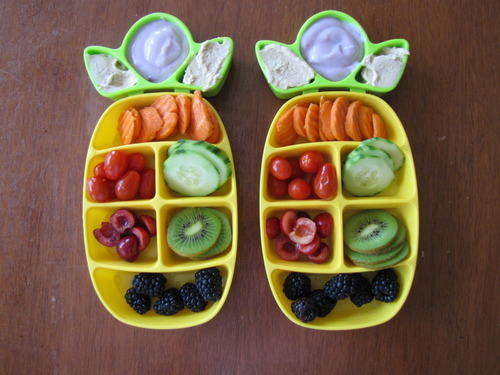 In The Family Nutrition Book he says to offer toddlers a "nibble tray", which really does work to introduce kids to variety! I used it with my own kids by offering foods they liked alongside new foods and it really helped them to try new foods. Now that they are older, they have no problem with trying new things! 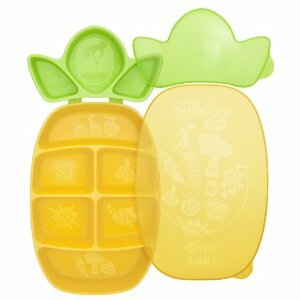 You can use an ice cube tray or a muffin tin to create a nice display of healthy fruits and veggies...or you can get this really cute Pineapple Nibble Tray! Dr. Sears says you should "Raise a Grazer" and allow the child to nibble on the tray throughout the day... but I disagree. I think this tray should be set out at snack time and then put away. Allowing a child to nibble throughout the day may cause them to nibble at meal times.